Fed up with being asked to donate to lots of different charities for lots of different events, two friends from Oldham have decided to take a different approach to fundraising and undertake 18 extreme physical challenges in just 12 months. The events include the Manchester 10k run, the Manchester to Blackpool 60k cycle ride, a 20 mile obstacle course and the notoriously difficult Tough Mudder challenge. 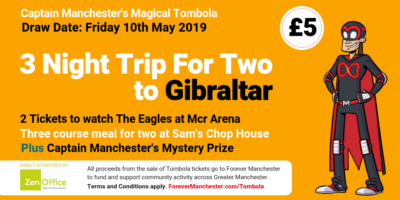 Darren Ratcliffe and Neil Buckley are completing the challenges for Forever Manchester – a charity which supports grassroots community activity throughout the ten boroughs in Greater Manchester. The charity has even adopted one of the events as its own official event – as the pair have arranged a walk up Mount Snowdon on April 26th. It’s a case of the more the merrier with 51 people having already signed up for the challenge. Three years ago, the challenge would have been impossible for Darren who owns RedStar Creative, a digital agency based in Manchester, as he weighed over 23 stone. Since then he has lost over 8 stone, citing becoming so active as a major factor in his weight loss success.